"On the green fields of our childhood, we followed the game ... played the game ... lived the game. The sounds and smells of warm summer days always led to baseball." $250 million. This contract felt similar to a stab through the heart for many baseball fans, myself included. When Alex Rodriguez recently signed this contract with the Texas Rangers, I wondered if any purity or innocence still existed in the game of baseball. Would the same electricity exist at the stadiums knowing that one player would earn more in a single bat than numerous fans make in one year? Younger baseball enthusiasts like myself were not alive to witness the time when money was not the major focus of baseball players. When It Was a Game 3 elegantly examines the innocence of baseball in the 1960s before divisional play, the designated hitter, and free agency. This original HBO documentary contains a facinating look back at a different era of major league baseball. Liev Schreiber's narration provides an overview of the basic points, with former baseball players, commentators, and movie stars presenting their thoughts and memories of the time period. Each section begins with eloquent passages from Kevin Costner, Andre Braugher, and Rita Moreno. Some might consider these words too hokey or sentimental, but to me they represent the passionate feelings about baseball once held by the American public. A majority of the commentaries by the players and experts are compelling and really drew me into the time period. In less than an hour, this documentary covers a wide variety of topics, including the stars of the decade, the cheapskate owners, tumultuous race relations, and defining moments. The speakers—who include Maury Wills, Billy Crystal, and Bob Gibson—obviously adore the game of baseball, and themes are treated with respect and importance. There's a difference in our passion for sports today in the era of free agency and greed. In the 1960s, the players possessed little control, and were at the mercy of the owners in terms of salaries. Now that they've gained control, team loyalty and a true love for the game is not as evident anymore. Bob Costas makes an excellent point about the progression of the game. "It's strange because relatively few games were on television," he says. "You couldn't say that we actually saw more baseball in the '60s. But maybe what we saw made a deeper impression." Obviously, everything was not wonderful and rosy in the baseball world during the 1960s. Some teams were hesitant to bring in African-American players, who had to try harder than the white players. Frank Robinson sums it up best when he comments that there were no black role players. This documentary does an excellent job covering the increased diversity of baseball at this time without overstating the message. The pictures and events speak for themselves, and extreme criticism is unnecessary in this presentation. In today's diverse baseball environment, it's difficult to understand that only 40 years ago players of different ethnicities were the exception. When It Was a Game 3 presents images of the legends of the game at the peak of their careers. It is especially valuable to young people such as myself who never saw Bob Gibson, Willie Mays, and Don Drysdale play. This documentary only touches the surface of the evolution of the game, but it hopefully will lead young baseball fanatics to remember and respect the history of the game. Image Transfer Review: This full-screen transfer contains its share of defects, but most of them are due to the age of the videos used. The entire documentary consists of baseball footage shot on primitive video cameras in the 1960s, and it obviously will not match the quality of more recent sports events. The pictures are surprisingly bright and clear, however, and they do capture the essence of the era without being distracting. The lack of a widescreen transfer on this disc is understandable because this show was created for airing on HBO. This does not completely exonerate them from criticism, but it makes the missing elements more acceptable. Audio Transfer Review: When It Was a Game 3 provides a look into the past combined with insightful commentary. A majority of the sounds are essentially dialogue, which works effectively in this 2.0-channel Dolby Surround mix. The audio is clear and intelligible, and the music flows well through the speakers to celebrate the innocence of the game. Nothing spectacular stands out from the sounds, but they complement the images nicely and fail to detract from the overall presentation. Extras Review: This DVD release contains no extra features of any kind, with the exception of "interactive menus", chapter cues, and a Spanish language track. The presentation of the menus is impressive, however, with video images and a music track running in the background. Plus, I really did not expect any significant extras on this HBO release. The documentary originally aired on HBO, and it was not created specifically for DVD release. Extras providing more background on the era would be nice, but this documentary stands well on its own as a glimpse into baseball's history. 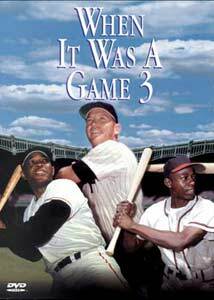 When It Was a Game 3 provides a wonderful historical overview of baseball in the '60s. It also presents the changes that would eventually lead to today's vastly different playing environment. Obviously, if you care little for baseball, this documentary will not interest you. For baseball fans, however, it evokes a sense of nostalgia missing from much of the game today.